This village home is available for letting just for the main 6 week summer holiday subjest to availability. 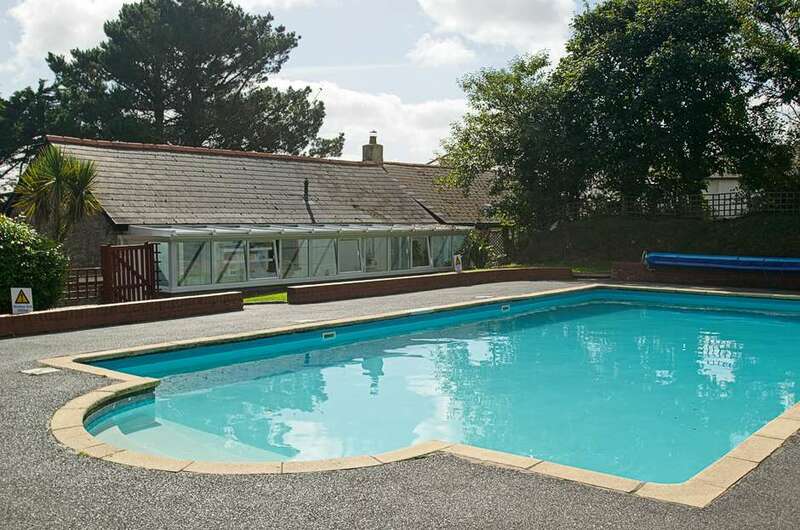 Willingcott Valley is situated within a peaceful, family- orientated complex of holiday cottages set in 100 acres of landscaped grounds, all located only approx 1 mile from Woolacombe Beach. There is an outdoor heated swimming pool situated at the rear of the cottage. The property itself is an original 18th century stone built two bedroom cottage with exposed timbers and traditional features restored in a fresh and contemporary fashion especially suitable for young families. It is prime position within the complex with a lawn at the front of the property and a large decked area for outdoor living. At the rear of the property is a modern conservatory that overlooks the heated pool and sunbed area. There is also further shared garden space beyond the pool incorporating a communal brick built BBQ and leading to a shared washing line. The living area of the cottage is furnished with contemporary leather sofas, antique pine furniture and has the wooden floors and whitewashed woodwork and beams that are throughout the cottage. There is Freesat TV and DVD and lots of children’s films. The kitchen is compact and well equipped; fridge, separate freezer, cooker, microwave and a washing machine. The unusual double bedroom has a walk-in wardrobe underneath a double loft bed. This is accessed via an open wooden ladder and may not be suitable for anyone less able. At the end of the bed there a flat screen TV. The delightful children’s room consists of white washed furniture, pine bunk beds and double doors opening onto the far end of the conservatory with a selection of children’s toys and games. In this sunny conservatory there is a dining table and chairs for family mealtimes and a further lounge area to enjoy this light and interesting space. The bathroom is compact and tastefully furnished with a shower over the bath. This pretty cottage is ideal for a young able family wishing to be near to Woolacombe and have the convenience of a pool and facilities on hand.